Vegan and Gluten-Free? Visit Sweet Freedom Bakery for Sweet & Savory Treats! Sweet Freedom Bakery, the Philly-based gluten-free and vegan institution, recently added a lineup of delicious, savory treats to its gluten-free, vegan and peanut-free menu. Known for beautiful and yummy cakes, cupcakes, cookies and brownies, Sweet Freedom’s addition of vegetable hand pies and hearty soups gives a new twist to eating healthy for those who must follow a gluten-free lifestyle. Allison Lubert, founder of Sweet Freedom, opened her first bakery in 2007 (on South Street in Philadelphia) to meet the needs of those seeking out gluten-free treats. 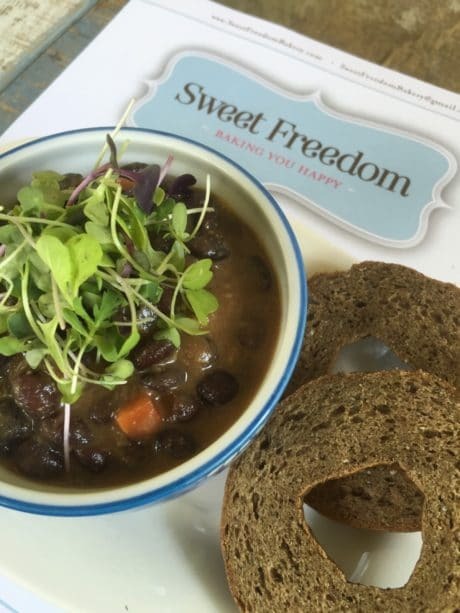 Now with three locations—in Philly, Collingswood (NJ) and Bryn Mawr—Sweet Freedom is a cornerstone for those with special dietary restrictions who still want to eat a sweet treat that meets the guidelines for a gluten-free and vegan diet. There’s a lot of great news happening at Sweet Freedom. With the addition of delicious and nutrient-dense soups and savory hand pies, the menu offers more than dessert. 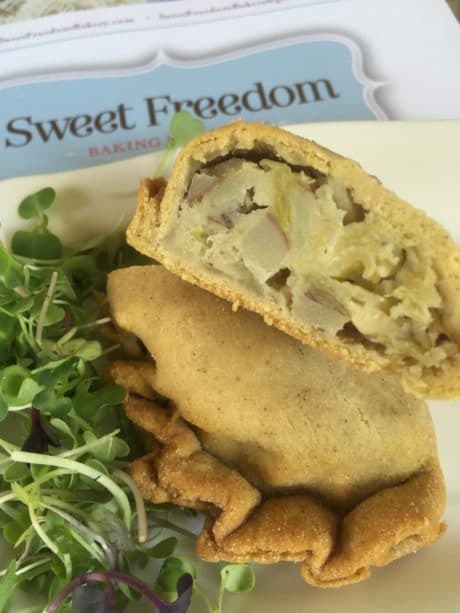 Sweet Freedom’s hand pies are stuffed with fresh veggies and wrapped in a flaky and light crust. Add the house-made fresh soups and you have a delicious, gluten-free meal right before your very eyes. It’s important to know that all food is prepared and cooked on premises; nothing is sourced or made in another kitchen, so there is no worry about cross-contamination. 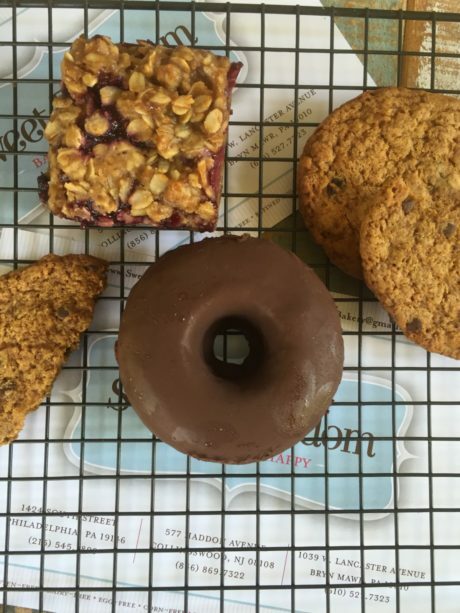 Friends and I sampled Sweet Freedom’s baked donuts, oat-fruit crumbles and cookies and were very pleased with the flavor, texture and very high “yum factor” of our treats! Best was a hot, steaming bowl of black bean soup served with a delicious, house-made fresh bagel. As I drove home from the Bryn Mawr location, I thought about the area’s college students who need to maintain a gluten-free lifestyle. They are rather fortunate to have Sweet Freedom Bakery so close to many universities and colleges located on the Main Line. Pizza, a staple for most college students, is also available. You do not need to be gluten-free to enjoy cupcakes and cookies from Sweet Freedom. The bakery’s desserts, soups and savory pies are, in fact, for everyone! Grab a friend and head to Sweet Freedom for a delicious lunch and dessert. Just make sure you get some to go. 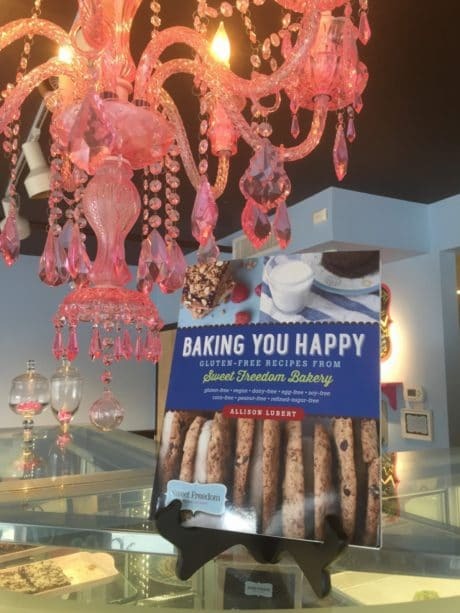 Find Sweet Freedom Bakery at one of these three locations: 1039 W. Lancaster Ave. in Bryn Mawr, phone: (610) 527-7323; 577 Haddon Ave. in Collingswood, NJ, phone: (856) 869-7322; and 1424 South St. in Philadelphia, phone: (215) 545-1899. » The Price is Right! We're giving away a years worth of doughnuts. » Get a behind the scenes look at SFB!